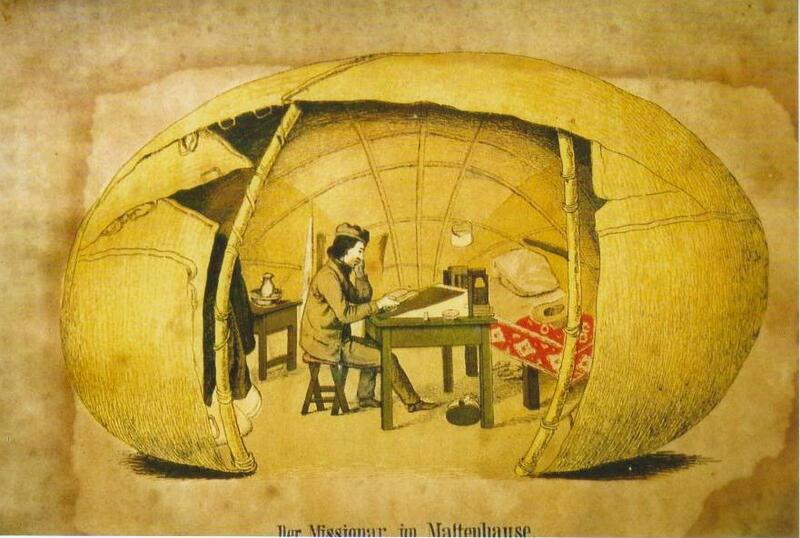 Missionary Krönlein or missionary Gorth studying in his rush-hut. (From diaz by pastor Walter Moritz). Not only the Namaqualanders, but also some missionaries in Great Namaqualand took to the rush-hut. The Norwegian missionary Hans Christian Knudsen, who came to Bethanien in 1842, depicted either Krönlein or Gorth writing at a table in a rush-hut. Parishioners at the Fish River often built a rush-hut for the missionaries to use, each donating a mat and a pole from their own house. The first church at Berseba was a rush-hut of extraordinary size to which eighty mats had been donated.